Japan is getting another unique Android from Sharp, the AQUOS Phone IS14H .he phone feature a form factor one might more immediately associate with a feature phone, but aside from its slide-out numerical keypad little else is shared. The IS14H features android 2.3, a 3.7-inch qHD display, and 8MP camera capable of 720p HD recording. Other standard goodies such as WiFi, Bluetooth, and GPS are topped off with a few cherries, which include a 1seg TV tuner, NFC, and infrared blaster. 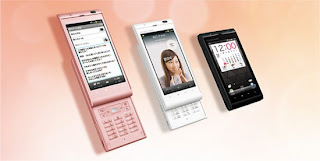 In Japan the phone will be sold by KDDI au, and as with most Sharp devices we expect it to remain a regional release. Next articleSamsung Galaxy S III: Concept rendering or leak?